It seems like every cake or cookie I make these days has to have lemon in it. This new-found obsession may be directly linked to my incredibly generous lemon tree. 1. Boil two large lemons for two hours then blend them, whole, in a food processor with 250 gr of sugar, 250 gr of almond meal and 5 egg yolks. 2. Add a teaspoon of baking powder. Whisk 5 egg whites until they form soft peaks. Gently fold in the lemon mixture. 3. Pour onto a greased and floured cake tin and bake at 170 degrees Celsius (338 degrees Fahrenheit) for 40/45 minutes. Cool down in the tin, then reverse onto a cake stand and ice with vanilla frosting. 1. Blend butter and sugar until creamy then add vanilla and milk. Beat for a couple of minutes on medium speed, until frosting is smooth. 2. 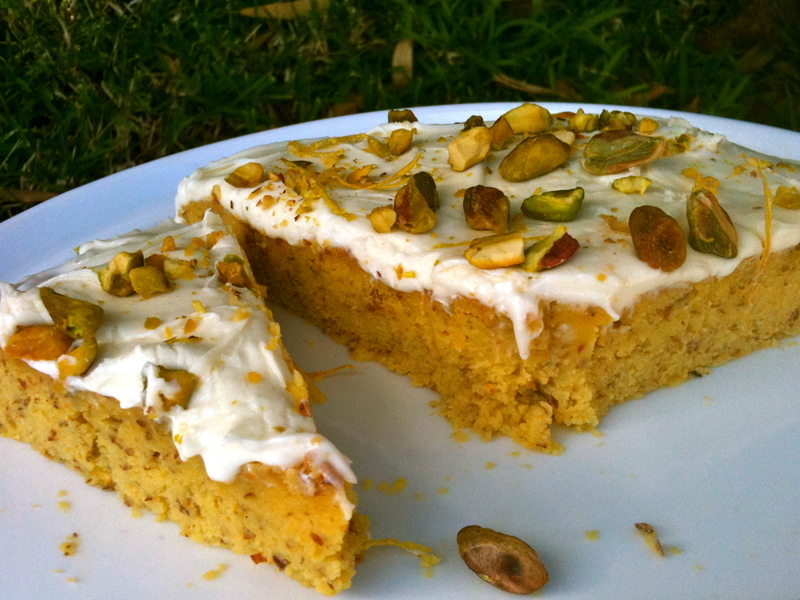 Spread frosting onto your cooled cake and decorate with toasted pistacchio nuts and lemon zest. For those of you with a sweet tooth, go visit this blog! Do you blend the whole lemon rind and all? Yes Cathy, as strange as it sounds! When you boil whole lemons for that much time, the rind will go very soft and will loose bitterness. I would suggest to cut them in half before blending them, to make sure to get rid of any peeps. I love baking. Sadly the feeling isn’t reciprocated. Produced a rock that if tossed could have caused serious collateral damage. However, on re-tracing the steps, baking powder bounced off the page so a 2nd attempt is definitely on the agenda as this looks so delicious. Your book hasn’t reached our shores yet but things take a while here. News reports on the NSW bush fires are utterly devastating and I hope you are all okay. Dear Su, thanks for your message. I have family that had to evacuate because of the fires, it’s been pretty full on…But we are all safe, so this is what matters! Give the cake another go, I promise you it’s worth it! Meant to tell you that I remade this and it was perfect! Warm wishes from South Africa for Christmas and the New Year and hope 2014 will be a wonderful year for you all. Oh, this makes me most happy!